What is a good GCSE? Matilde talked about the presentation from Jane Jones that happened at last week’s National Maths Hubs Forum. A survey by Ofsted highlighted that many “schools’ principal focus is the new GCSE and that too many don’t seem to realise that getting KS3 right should boost performance at GCSE” – to me this was to be expected. 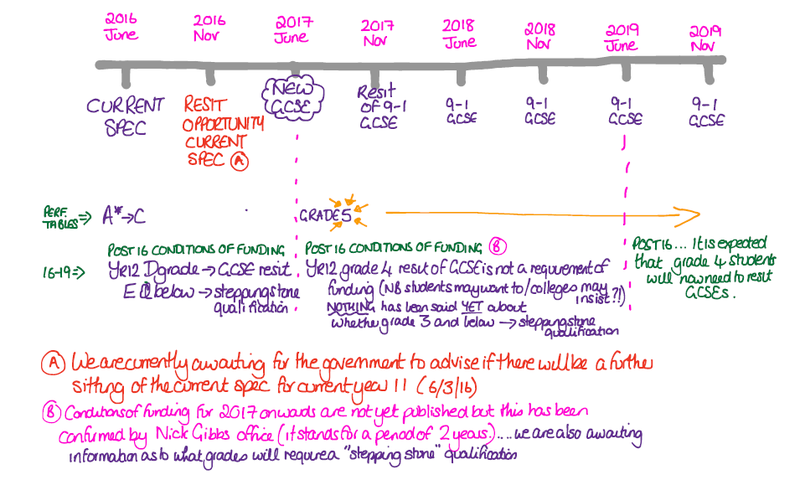 The massive change in style of GCSEs has definitely spooked many (if not all) schools and it is no surprise that there will be a large focus on the new GCSE. Ofsted have also highlighted that so far the new national curriculum has had no significant impact on teaching quality – again this doesn’t seem to be a surprise as it hasn’t been around long. A fact from Matilde that I found interesting is that the introduction of new national curriculum in Singapore in 1980 didn’t show improvements in teaching and results for 10 years! She also highlighted that none of the current secondary textbooks develop reasoning well; “worded” application questions at the end of a chapter doesn’t develop this. Ofsted have highlighted that the recruitment and retention of suitably qualified staff and subject leaders is a challenge. Personally I am quite worried about the lack of subject specialists – I wouldn’t want my daughter taught by non-specialists (or at least people who haven’t gone through subject conversion courses) in any subject. Maths is an subject full of connections, I think that a certain level of exposure to maths or a love of exploring maths is important to be able to express this nature of the subject well to students. It’s always good to hear views from John Mason and his view that activities are not good activities unless you can make them deeper I think is great. I enjoyed the reminder to re-read the summary that Bruno Reddy (@MrReddyMaths wrote following last years #ofstedmaths chat which is available here. We discussed the challenge of marking and how Ofsted will check that teachers mark in line with a schools policy, and how this potentially may not be best suited to the teaching of mathematics. In the league tables 5 will count as a ‘good grade’, but that for the first two years, grade 4s won’t need to resist. This post from Mel (@Just_Maths) was mentioned, and I find her timeline particularly useful. This very useful document from The Further Mathematics Support Programme was shared which is well worth a read, and if you haven’t already take a look at their A-Level 2017 page. Interesting discussions about CPD need for local departments in the coming years.